Roughly 60 percent of the respondents said they had cut back on credit card purchases, discretionary spending, and holiday travel plans, according to the report released Tuesday. The top two ways Californians have curbed spending are to splurge less in restaurants (71 percent) and on clothes (69 percent). Survey respondents said they were also going to the movies less, buying fewer name-brand items and deferring home improvements. However, consumers have shown reluctance to cut back on cellphone and Internet use, said Rebecca Macieira-Kaufmann, president of Citibank California. 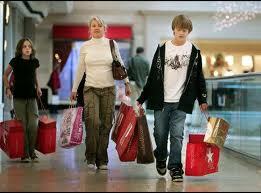 “People seem to be prioritizing social networking over spending money on food or clothes,” Macieira-Kaufmann said. The new survey also found that 63 percent of consumers were reducing credit card purchases, 55 percent were working to lower debt, and 54 percent were postponing a major purchase. Look everyone is scared, people, business ect. It is the lack of knowing what the playing field will be. The goverment is wasting our money with no results, bailouts that do not work, stimulus that did not create jobs, what are our taxes going to be next year? What is the healtcare bill really going to do to business. The only growth industry is goverment, in DC there is no unemployment problem. Untill I know what lies ahead I will not spend my money, I will continue to look at ways to reduce my business overhead. Washington gridlock may be the best thing we can hope for at least no new laws will leave us alone. Nation consumers reluctant to get deeper and more into debt!!!!!!!!!!!!!!!! Do the survey results correlate with what Citibank card users are charging on their cards? Are survey respondents actually spending less on dining and clothes on their cards, or are they simply saying that they are. It should be a no-brainer for Citibank to compare spending habits with survey results, and that’s where the rubber meets the road.